This session is about putting your players' fitness levels to the test. It's a tough session, but a highly rewarding one, that teaches players to look for the early pass, move the ball into space and use their hips in the pass to generate more power. 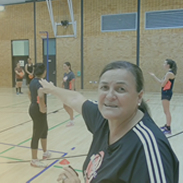 The tougher fitness work is sandwiched between fun passing drills and games to help keep your players motivated throughout the session, including a conditioned game of Aussie Rules to develop players' decision making skills and awareness.